This textbook, designed for a single semester course, begins with basic set theory, and moves briskly through fundamental, exponential, and logarithmic functions. Limits and derivatives finish the preparation for economic applications, which are introduced in chapters on univariate functions, matrix algebra, and the constrained and unconstrained optimization of univariate and multivariate functions. The text finishes with chapters on integrals, the mathematics of finance, complex numbers, and differential and difference equations. 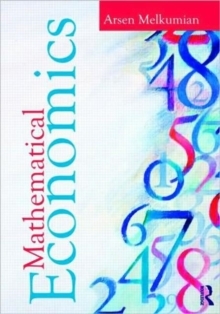 Rich in targeted examples and explanations, Mathematical Economics offers the utility of a handbook and the thorough treatment of a text. While the typical economics text is written for two semester applications, this text is focused on the essentials. Instructors and students are given the concepts in conjunction with specific examples and their solutions.